Theoretically, the thesis is situated within the field of discourse studies with Nexus Analysis as its primary theoretical and methodological approach. Nexus analysis distinguishes itself from other discourse analytic approaches by focusing on central mediated actions carried out by social actors within a loosely tied ‘nexus of practice’ (rather than focusing solely on discourse). The term nexus of practice refers to the social field where humans, discourses and cultural artefacts intersect and result in social action. In the thesis, young people’s use of social network sites are analysed as a nexus of practice with the purpose of identifying the most prominent and central mediated actions and cycles of discourses. A nexus analysis is carried out through three phases: engaging, navigating and changing the nexus of practice. The primary activities in the engagement phase consist of ethnographic engagement, collection of a wide variety of data and the researcher’s establishment of a ‘zone of identification’. The main activities of the navigation phase are to organise, document and analyse the various data collected, whereas the changing phase consists of reflections on how the results of the nexus analysis affect or contribute to changes within the overall nexus of practice. Grounded in the detailed engagement in the first phase of the nexus analysis, the thesis’ navigation phase has been structured around three analytic themes which represent the most central cycles of discourses within the nexus of practice. Practising friendship is an essential part of Danish young people’s use of social network sites. In the first analytic theme, the central (and often completely routinised) mediated actions the users carry out to create or maintain social relations are analysed. In relation to this, it is discussed what characterises a friendship online and how young people’s use of SNSs are contributing to a transformation of the traditional notion of friendship. In the second theme of the analysis, a quite specific mode of communication is examined. This mode of communication is characterised by a particular love discourse that exists among best friends on SNSs, where statements such as ‘I love you’ appear frequently in their interactions. The different functions of this emotional communication are discussed, as are the meanings of why these statements are often publically available, or even strategically, intentionally placed on the young people’s profiles. In relation to this, it is argued that the users – through these emotional communicative actions – become co-constructors of each other’s identities, which reflects or can be characterised as an ‘open source’ networked identity. In the final analytic theme, it is analysed and discussed how young people cope with and handle unpleasant experiences which arise from time to time when they use social network sites. This discussion is grounded in how the young users themselves experience, articulate and account for risks related to their use of SNSs and it examines their strategies to navigate and handle the unpleasant experiences. The analysis shows how young people experience a tension or contradiction between their own concrete, local experiences and the public discourses which surround their use of new media. Following from this, it is argued that young people have a need for their local (and most often positive) experiences to be acknowledged and taken serious. This need has been particularly clear in a period of time where social network sites were a new phenomenon (mostly used among young people), and where the public debate primarily focused on dangers and risks. Finally, the relations between mediated actions and public discourses are treated at a more overarching and general level. As part of the changing phase within the nexus analysis it is discussed how the thesis and public dissemination of empirically grounded research contribute to the public debate and can create a better and more nuanced understanding of Danish youngsters’ use of social network sites. I will get back with more info when I have news about the future defence. 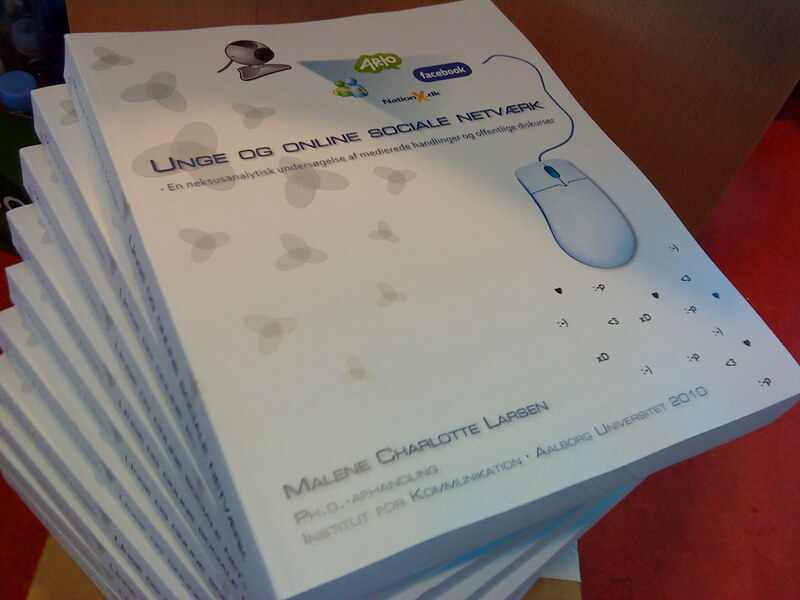 he present PhD thesis investigates Danish children and young people’s use of a relatively recent web-phenomenon: Online social networking. The so-called social network sites (SNSs) are internet based social spaces where users via personalised profiles can list each other as friends and communicate and socialise across time and space. The main purpose of the thesis is to gain an understanding of the meanings SNSs, such as Arto and Facebook, have for young people’s individual and social lives and how they use them as part of everyday life. In order to investigate this, the thesis takes its analytic departure in an extensive amount of various empirical data. The primary data consist of five years of ethnographic engagement (including participatory observation within the field) and a large-scale qualitative questionnaire aimed at investigating the experiences that 12-18 years old Danes have on social network sites. In this way, the thesis encompasses both the level of social actors and the level of discourse. It explores and analyses the central actions young people carry out across social network sites, as well as the ways in which they discursively construct and articulate their concrete use and experiences. congratulations on both counts, Malene! Wouw, Malene. Tillykke med både aflevering og graviditet. Perfekt timing :-). Nu må du ud og nyde både sol og mave. Tillykke med du har afleveret! Er selv gymnasielærer med interesse for at inddrage sociale medier i undervisningen. Håber der kommer en easy-reader version til det danske marked på et tidspunkt. hello. 🙂 i really need to have a copy of your thesis.. would you mind sharing it to me? i’ll use it for our thesis as well.. i just need a comparison about some studies done and about our present study. please? i’ll really appreciate it. thanks you so much. congrats for your baby first. Now, hope u wud have had ur viva. I have also submitted my thesis. Hi, Malene,can you plz give me the questionnaire format used….. plz help me out i m a student from Jai Narayan Vyas University Rajasthan.